AL-WARITH is the one to Whom everything is returned after the death of its owners; this is Allah, Praise and Glory be toHim, He is the Everlasting after the extinction of His created beings;He is the INHERITOR to Whom all properties are retrieved after its possessors perish. He says, “It is We Who will inherit the earth, and all beings thereon” (MARYAM, 40), “..Thou artthe best of inheritors” (ANBIYA’, 89). Allah inherits everything after the annihilation of allcreatures. 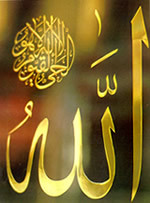 He says, “Whose will be the dominion that day?”,and He answers, “That of God, the One, the Irresistible” (GHAFIR, 16). All the claims of the human beings tumbleas the majority of people think they hold sway over the sovereignty ofthe universe, the real truth is revealed to them on that day that the realand true Possessor is Allah. As for people of insight they are aware that Allah is the Lord of Power and Authority eternally; no one can ever possess anything, but He possesses everything; Allah is the Lord of the worlds. Heis the true INHERITOR, Praise and Glory be to Him, He is Allah.